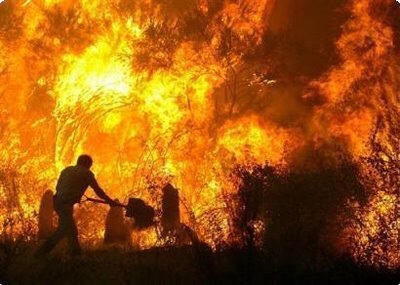 As if we didn’t have troubles enough, Greece is now, literally, on fire. Huge blazes have broken out concurrently: around Athens, in the Peloponnese, and on some islands. The gods must be angry with us, indeed. Or perhaps it’s not the gods? There is talk of arson; of a plan to destabilize the government. More conspiracy theories? Heat and high winds are a dangerous combination for woods that have seen no rain for months. Rubbish such as glass bottles can also play a part, as well as people’s irresponsible behaviour. But we had a similar situation in the summer of 2007, in another politically unstable period under the Karamanlis government, when forest fires caused the death of 84 people and 4,5 million olive trees were burnt. Be that as it may, it’s another disaster, more damages for people and a country that can ill afford them. Having lived through two fires myself, some years ago, I agonize for the people involved and, indeed, for the huge destruction of nature. 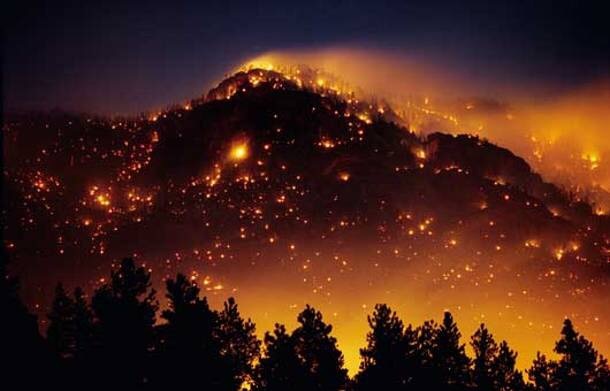 There is nothing more heartbreaking than watching a mountain burn. In our case, luckily our house itself did not burn either time, but everything around it did. At night, the hillside across from us was lit by a wall of flame, against which black silhouettes of houses and trees could be seen. An apocalyptic vision of hell. Bringing coffee to the firemen, we had to fight our way from our car to the fire engines in a storm of swirling ash flakes. For days, trees or bushes you’d thought had been put out would flare up again. The lawn was black. Inside the house, however much you cleaned and scrubbed, bare feet would be black with soot. And the smell of burnt just would not go away. We’ve had to replant our garden twice. I pray for the people fighting the blazes; firemen, volunteers, neighbors, even old ladies passing buckets of water. And for the fearless pilots who fly into the smoke and flames to dump water – that is how our house was saved – and then back down to the choppy, wind blown surface of the sea to fill up their tanks. A dangerous job indeed; and in these strained financial times, one can only hope the planes and helicopters have been properly maintained.